The National Disability Mentoring Coalition has announced the 2018 Call for Nominations for the Susan M. Daniels Disability Mentoring Hall of Fame. The Hall of Fame was created to honor individuals who are making a significant difference in the lives of youth and adults with disabilities through mentoring and to raise awareness about the importance of mentoring for individuals with disabilities. NOMINATE a mentor or mentoring program between now and — our just extended deadline — of August 31st! The Hall of Fame’s namesake, Susan M. Daniels, devoted her life to improving the lives of others with disabilities. As a person with a disability who achieved enormous professional and personal success, she had significant impact as a senior policy maker and a mentor to hundreds of individuals. 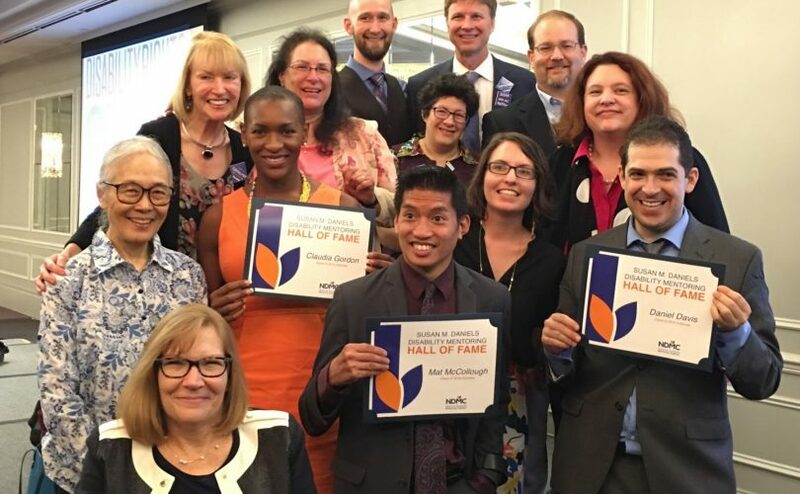 In 2015, the Coalition named 25 outstanding leaders as the first inductees into the Hall of Fame to mark the 25th anniversary of the Americans with Disabilities Act. Those inductees were selected for their demonstrated commitment to mentoring and for their impact on improving the lives of people with disabilities. Since then, 42 individuals and eight mentoring programs have been inducted into the Hall of Fame through a public nomination process. Visit the Hall of Fame for full reviews of the 2015, 2016 and 2017 honorees. The 2018 honorees will be announced in October. The founding sponsors for the National Disability Mentoring Coalition and the Disability Mentoring Hall of Fame are the Mitsubishi Electric America Foundation and PolicyWorks, Inc.
About the National Disability Mentoring Coalition: The National Disability Mentoring Coalition (NDMC) aims to raise awareness about the importance and impact of mentoring in the lives of people with disabilities and to increase the number and quality of disability mentoring programs around the country. Established in December 2014, NDMC transitioned in March 2018 to Partners for Youth with Disabilities (PYD). © 2018 National Disability Mentoring Coalition. All Rights Reserved.